One of the top-ranked business schools in the nation, The University of Virginia Darden School of Business offers a hybrid Executive MBA degree, providing students with a combination of onsite and distance learning. Students in the EMBA program have access to the same world-class faculty as full-time, onsite MBA students, but the flexibility to work around a professional work schedule. Darden eschews a traditional lecture model in favor of a case method approach to business pedagogy, which asks students to apply critical thinking to real-life business challenges. Courses are often guided by more than one faculty member, and case studies tend to be completed by cohorts of MBA students organized into teams. Participants in the EMBA program have the option to complete coursework and projects online, but the program does require on-campus residencies for all students, with several flexible scheduling options. 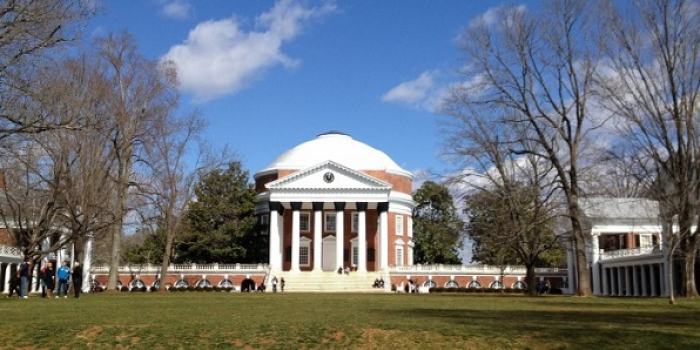 Darden Associate Dean Ron Wilcox graciously spoke with us regarding UVA's competitive and reputable program. Who is the typical EMBA student at Darden? Does he or she live near campus or further away? About 15% of the class come from the local Charlottesville area. Another 40% come from the DC area. The rest come from various places around the U.S.
Darden offers onsite residencies as part of a blended model. How does this enhance the distance learning experience? The residencies are not designed to enhance the distance learning experience. The opposite is true. We used distance classes to give students background, often technical, material that will be used in the course of their case discussions during onsite residencies. Are there any unique program concentrations for EMBA students? How accessible are faculty in between the onsite residencies? Highly accessible. In addition to the distance learning experiences faculty engage in discussion boards, answer email and engage in Skype sessions. How many students enroll each year? What is the ratio of faculty to students? There are about 14 core faculty, another 8 elective faculty and several faculty that have a few class sessions. Total students/total faculty is about 2.5 to 1. How can EMBA students take advantage of career service resources at Darden? They have access to the same career counseling resources as a residential student, which are quite extensive. They also have an opportunity to have a career coach as part of our elective offerings. Any words of advice for prospective EMBA students? This is a program for those who are currently employed and plan to remain employed during the duration of the program. For those students, it is an MBA of unparalleled quality --- access to what is widely regarded as the best teaching faculty in the world and the ability to immediately apply what you have learned. Thanks to Professor Wilcox for chatting with us!